Tracking Down The Best ‘Babi Guling’ (suckling pig) in Bali. 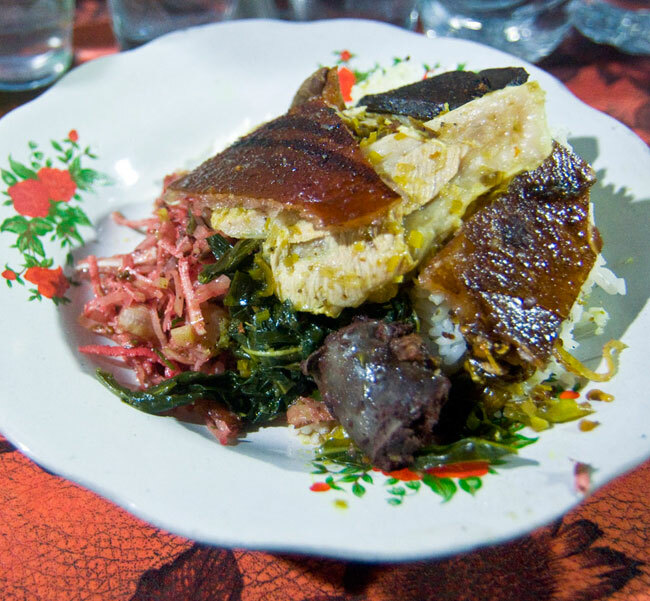 Babi Guling is the most widely known as Balinese dish and tourists have even been known coming to Bali just to eat it. 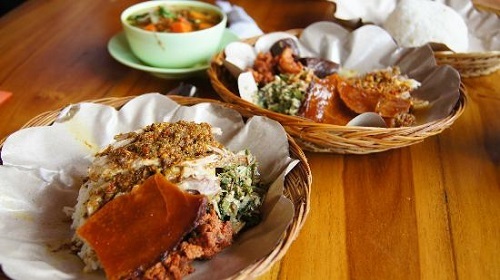 The most famous place for Babi Guling would be none other than Ibu Oka in Ubud but it is it really the best? Finding the best Babi Guling though takes a lot of work and perseverance, however. 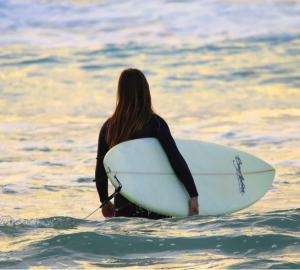 For those that have never tried it, go out immediately and track some down – it is 100% worth it! Babi Guling (English: Suckling Pig) is a whole pig roasted over a fire and cooked to perfection. The Balinese love their Babi Guling and many ceremonies include it, not just as a food but also as an activity – the act of actually cooking it that is. The recipe for cooking Babi Guling can vary a bit here and there but generally the main recipe is pretty much the same everywhere. Having grown up to taste the food from some odd 12 years ago when the restaurant is relatively still unknown to tourists, the taste remains unchanged and very delicious!! Just like how it was back then!! The only thing that changed was the price, became slightly more expensive. But then again, for a good 1 off individual dish with Rice, a good portion of delicious pork meats, some vegetables and the crispy skin plus a bottle of water or Coca-cola will cost you about $3 – $5!! You can even order JUST the meat on its own if you decided to indulge in just their meats that are marinated with their specialty spice and walk out with a full belly. If you think that Babi Guling (Suckling Pig) Ibu Oka in Ubud is good. Then you haven’t eaten the best yet. Babi guling pak malen is DA BOMB!! The crispiness of pork’s skin, the juiciness of the meat, the deliciousness of the pork satay will stay in your mouth, your mind and your soul for a very long time. The place is no fancy, but clean. 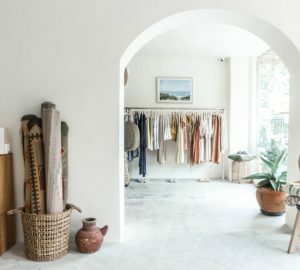 And compare to Ibu Oka, this place is easy to reach if you’re staying around Seminyak – Legian. You can also order it to take away (make sure they put the rice and vegetables on separate container) and order for extra crunch. Then you’re good to go! From a few stalls, Warung Nasi Babi Guling Men Agus most fitting on tongue. All feels good! The skin not too hard and the meat so delicious!! And what makes us amazed; the price is only IDR 25,000. It’s totally worth it!! But the location is quite hard to find. The place somewhat dusty and the smoke from people who burn the garbage near the place are somehow quite disturbing. However, it’s still one of recommended places for best Babi Guling in Bali. Looks very down to earth, this eating place has high quality suckling pig sets to offer. They are guaranteed to be crunchy and full of flavors. One of the most famous spot in Nusa Dua, you better be prepared for long waiting time during lunch hour when you visit the place. Another important thing to remember is to order non-spicy if you cannot handle heats. 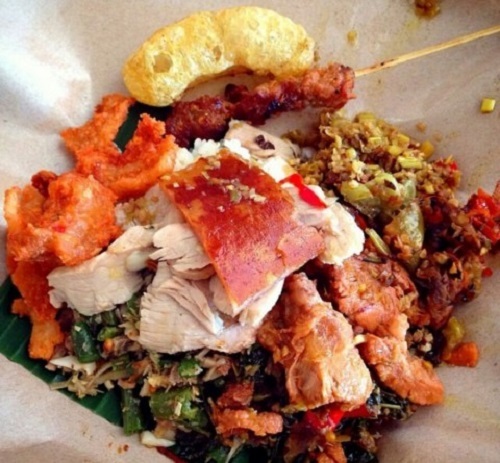 A big portion will cost a little expensive, around IDR 35,000, but still worth it! 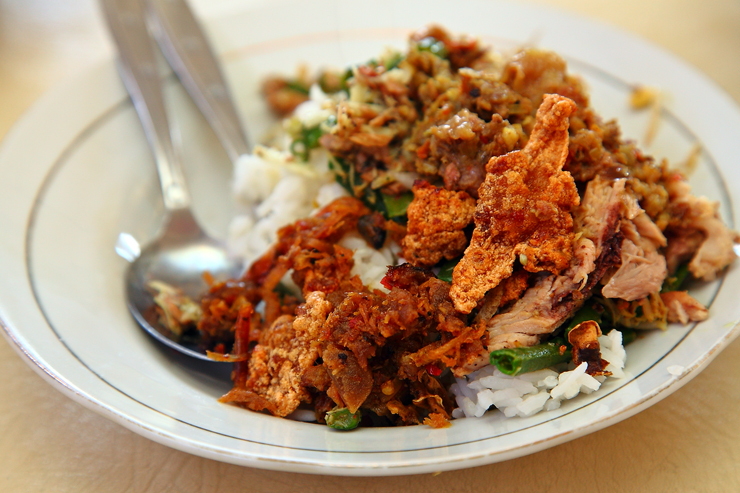 Recommended by many locals, Babi Guling Chandra should be on your list when you are visiting Denpasar. They only open in the evening until midnight everyday, and the price ranged from IDR 10,000 to IDR 40,000 per portion, depends on the package selection. Other than delicious suckling pig, this restaurant also famous for its juicy pork satay and super spicy sambal. However the place is often crowded and may feel a little hot inside, so try to wear light. If you have a sudden midnight carving, take a drive to Babi Selingsing Cempaka! This hidden gem only open at 2AM in the morning until around 7AM, or when they are sold out. To spot it, you need to walk a little further and trust your nose to guide you. What an adventure, right!? Everyday the owner only cook two pigs and you can watch the process while waiting for your late meal. Many people recommend this place because of its authentic flavor, which means more savory and spicy than the usual tourists jam-packed place. 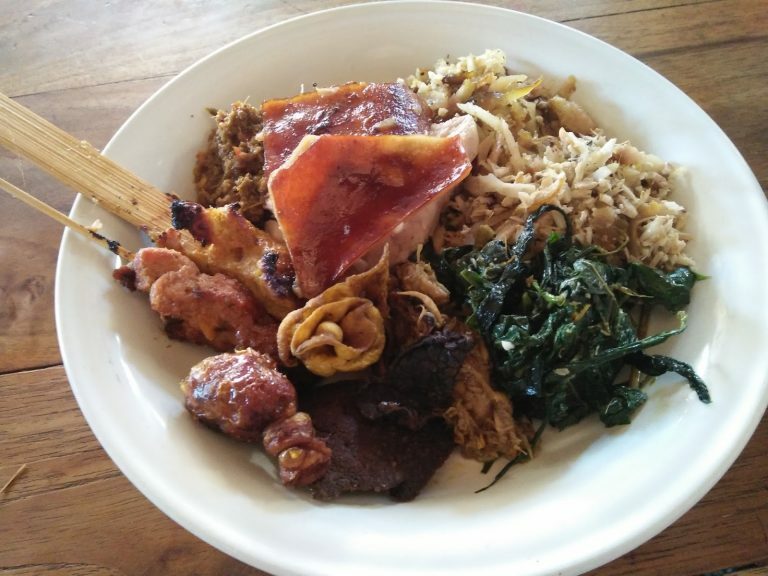 If you have little time in Bali, perhaps Babi Guling Nadi Jaya is the right place for you. At this humble place, you can taste variation of traditional pork dishes other than the famous suckling pig, such as fried pork, and pork skin skewers! They are all delicious too! We suggest visit the place before the sun set or there will be no skewers left. The service is quite traditional though, so don’t be surprised when they prepare your meal with bare hands.